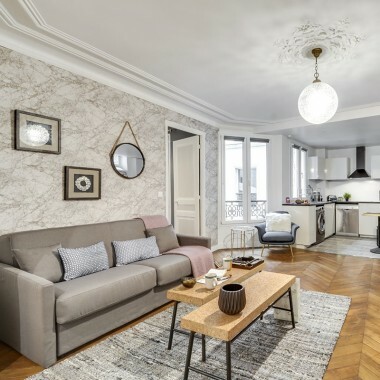 This beautiful newly renovated three bedroom apartment sits right at the heart of the historic Marais, in a 16th century building. The apartment is on the second floor with lift access. It is just a short walk from famous Place des Vosges and close to many notable museums, including the Maison Victor Hugo, Musée Picasso, Musée Carnavalet and the Centre Pompidou. It is also convenient for charming boutiques, cafés and fresh food markets. To the south, towards metro St-Paul, there are unique antique and vintage shops and, to the north, you will find the great food market, the Marché des Enfants Rouge, as well as the nearby cultural event centre, Carreau du Temple, surrounded by a number of Paris’ trendiest cafés and cocktail bars. The interior of the apartment (118m2) features an impressive foyer with hardwood floors. Just adjacent is a guest WC. With three large windows, and southern exposure, the living room/dining room is bright and beautiful. The living room has wing-back chairs, a leather sofa that converts into a double bed, and a large entertainment centre. The dining room sits between the living room and the fully-equipped, gourmet kitchen has a bar with built-in sink, a La Cornue gas stovetop, a Nespresso machine, and much more. To the left, from the foyer, is the romantic master suite with queen bed, and an en suite bathroom with WC, large basin, and shower. To the right of the foyer is a hallway leading to the second and third bedrooms and the shared full bathroom. The second bedroom has a queen bed, double closet, dressing table/desk, and chair. Across the hall is the modern main bathroom, complete with a combination bathtub and shower, WC, basin, and heated towel rail. At the end of the hall is the third bedroom with twin beds. This room is ideal for children or two adults requiring separate beds. Amenities include central heating, flat screen cable TV, DVD player, Bose sound system, Wi-Fi internet, printer/scanner, clock radio, washing machine, dryer, ironing facilities and hairdryer. Fans are available during the summer if required. 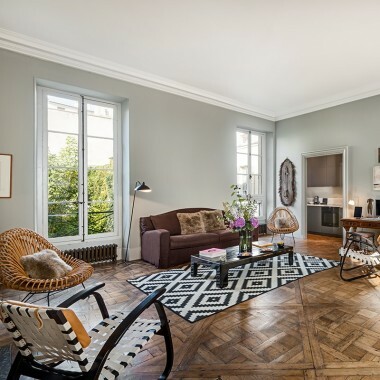 This beautiful three bedroom apartment to rent in Paris, sits right at the heart of the historic Marais. 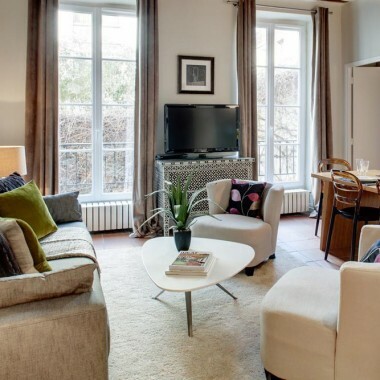 It is just a short walk from famous Place des Vosges and close to the Maison Victor Hugo, Musée Picasso, Musée Carnavalet and the Centre Pompidou. 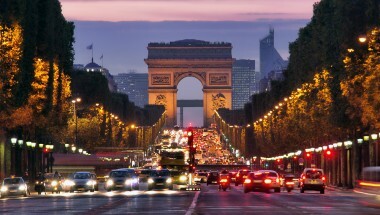 It is also convenient for charming boutiques, cafés and fresh food markets.